Curcumin is a plant derivative with biological effects, including potential for the treatment of Parkinson’s disease (PD). It is known that monoamine oxidase B (MAO-B) is involved in PD due to its role in the degradation of various neurotransmitters like dopamine, the main declined factor in PD. Since MAO-B inhibitors (e.g. safinamide) are used as the support for the treatment of PD, we planned to evaluate the in silico interaction of curcumin with one subunit of the MAO-B enzyme in comparison with safinamide. The crystal structure of human MAO-B (PDB entry code 3PO7) was selected from the Protein Data Bank (https://www.rcsb.org). The molecular structures of curcumin (CID: 969516) and safinamide (CID: 131682) were obtained from PubChem (https://pubchem.ncbi.nlm.nih.gov). Chimera 1.8, AutoDock Tools-1.5.6 software and AutoDock4 software were used for this in silico study. The results revealed that the binding energies (ΔG)s of the conformations of curcumin and safinamide, showing the best down ΔG, were -11.15 kcal/mol and -11.09 kcal/mol, respectively. Moreover, the inhibition constants (Ki)s of both ligands were near quantities. Hence, it may suggest that curcumin and safinamide form nearly similar stability with the subunit of the MAO-B enzyme. More experimental studies may reveal the similarity of curcumin with safinamide about the inhibitory effect on MAO-B. Curcumin is a natural polyphenol compound with several biological and medicinal effects (Figure 1A) (1). Curcumin is derived from the curry spice turmeric that is produced in several Asian and South-American countries (1, 2). Accordingly, curcumin shows potential for the treatment of neurological diseases including Parkinson’s disease (PD) (1). Figure 1. Chemical structures of curcumin (A) and safinamide (B). MarvinSketch was used for illustrating the chemical structures, MarvinSketch 17.14.0, ChemAxon (https://www.chemaxon.com). Monoamine oxidases A and B (MAO-A and MAO-B) are the two human isoenzymes of the monoamine oxidase enzyme (3). The MAOs are flavin-dependent mitochondrial enzymes that are involved in the oxidative degradation of various aromatic amine-containing neurotransmitters (3). Evidently, MAO-B is involved in neurodegenerative diseases including PD, which is related to dopaminergic neuron degeneration (4). Since MAO-B inhibitors can selectively inhibit the metabolism and increase the synthesis of dopamine (4), they are presently used as the support for the treatment of PD (3). For instance, safinamide is a highly selective and reversible MAO-B inhibitor that is part of the management of PD (Figure 1B) (5). Accordingly, we intended to evaluate the in silico interaction of curcumin with one subunit of the MAO-B enzyme in comparison with safinamide, the well-known MAO-B inhibitor. The crystal structure of human MAO-B (PDB entry code 3PO7, 1.8A° resolution) in complex with zonisamide was selected from the Protein Data Bank (https://www.rcsb.org) (6). Chimera 1.8 software was used for editing the enzyme protein and building the extension file “pdb”. As the MAO-B forms a homo-dimer (7), we selected one subunit (chain B) for this docking procedure; moreover, all other molecules were deleted except FAD cofactor (8). The structures of ligand molecules, including curcumin (CID: 969516) and safinamide (CID: 131682), were obtained from PubChem (https://pubchem.ncbi.nlm.nih.gov). AutoDock Tools 1.5.6 software and AutoDock4 software were used for the docking procedure based on the previous studies (8, 9). Briefly, the grid of the enzyme was made by adjusting 68 × 68 × 72 grid points in xyz dimensions (8); moreover, the grid spacing was 0.375 A°, and the grid map was built based on the substrate-binding site (10, 11). All molecular docking simulations were based on the Lamarckian genetic algorithm (8). In addition, the other parameters, i.e. the population size: 150, the maximum number of energy evaluations: 2,500,000, and the maximum number of generations: 27000, were fixed (8). The output was an extension file “dlg” that contained the result of the docking procedure, including the binding energies (ΔG)s and inhibition constants (Ki)s of the conformations of each ligand (8, 12). Finally, the conformation of each ligand, presented the best down ΔG, was selected to display and discuss (12). The results of the in silico interaction of curcumin and safinamide with one subunit of MAO-B are shown in Figure 2. Figure 2. The interaction modes of curcumin (yellow ligand) (A) and safinamide (purple ligand) (B) with one subunit of the MAO-B enzyme (shown in gray color). 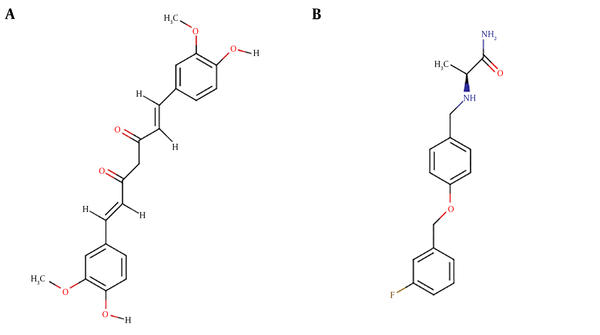 According to the docking results, the binding energies of the conformations of curcumin and safinamide, showing the best down ΔG, were -11.15 kcal/mol and -11.09 kcal/mol, respectively. As it has been considered that ΔG can determine the stability of any given protein-ligand complex (13), the near quantities of the ΔG(s) of curcumin and safinamide suggest that these ligands may form a nearly similar stability with the subunit of the MAO-B enzyme. Notably, the quantity of curcumin ΔG (-11.15 kcal/mol) is less than its binding free energy (-6.31 kcal/mol) calculated by a similar docking study (14). However, the different measures of these calculated binding free energies in two separate studies may be due to some differences in methods. Moreover, the conformations of curcumin and safinamide, showing the best down ΔG, presented the Ki values of 6.72 nM and 7.48 nM, respectively. It has been mentioned that Ki can be theoretically used to rank order binding affinities of various inhibitors for a common enzyme (15). This in silico study revealed that the Ki values of curcumin and safinamide seem to be near mathematical measures; therefore, it could be proposed that curcumin and safinamide may present near binding affinities to MAO-B. The results of this in silico study is in agreement with the MAO-B inhibitory effect of curcumin and its metabolite tetrahydrocurcumin in a mice model of PD (16); those experimental findings suggested that the inhibition of MAO-B by curcumin and tetrahydrocurcumin would be helpful in impeding the progression of PD (16). In conclusion, the results of this in silico study revealed near quantities for ΔG and Ki of the conformations of curcumin and safinamide, showing the best down ΔG, in the interaction with one subunit of the MAO-B enzyme. Certainly, more experimental studies are required to disclose the similarity of curcumin with safinamide about the inhibitory effect on MAO-B for the treatment of PD. We are grateful to Autodock, ChemAxon, and Chimera for giving us permission to use the valuable software. We thank Neuroscience Research Center and Iran University of Medical Sciences for supporting this study. Conflict of Interests: The authors declare that there are no conflict of interest. Funding/Support: Neuroscience Research Center and Iran University of Medical Sciences. 1 Fu W, Zhuang W, Zhou S, Wang X. Plant-derived neuroprotective agents in Parkinson's disease. Am J Transl Res. 2015;7(7):1189-202. [PubMed: 26328004]. [PubMed Central: PMC4548312]. 2 Bengmark S, Mesa MD, Gil A. Plant-derived health: The effects of turmeric and curcuminoids. Nutr Hosp. 2009;24(3):273-81. [PubMed: 19721899]. 3 Binda C, Aldeco M, Geldenhuys WJ, Tortorici M, Mattevi A, Edmondson DE. Molecular insights into human monoamine oxidase b inhibition by the glitazone anti-diabetes drugs. ACS Med Chem Lett. 2011;3(1):39-42. doi: 10.1021/ml200196p. [PubMed: 22282722]. [PubMed Central: PMC3263826]. 4 Kong P, Zhang B, Lei P, Kong X, Zhang S, Li D, et al. Neuroprotection of MAO-B inhibitor and dopamine agonist in Parkinson disease. Int J Clin Exp Med. 2015;8(1):431-9. [PubMed: 25785014]. [PubMed Central: PMC4358469]. 5 Cruz MP. Xadago (safinamide): A monoamine oxidase b inhibitor for the adjunct treatment of motor symptoms in parkinson's disease. P T. 2017;42(10):622-37. [PubMed: 29018297]. [PubMed Central: PMC5614412 this article]. 6 Binda C, Aldeco M, Mattevi A, Edmondson DE. Interactions of monoamine oxidases with the antiepileptic drug zonisamide: Specificity of inhibition and structure of the human monoamine oxidase B complex. J Med Chem. 2011;54(3):909-12. doi: 10.1021/jm101359c. [PubMed: 21175212]. [PubMed Central: PMC3071873]. 7 Ramsay RR. Molecular aspects of monoamine oxidase B. Prog Neuropsychopharmacol Biol Psychiatry. 2016;69:81-9. doi: 10.1016/j.pnpbp.2016.02.005. [PubMed: 26891670]. 8 Mathew B, Mathew GE, Ucar G, Baysal I, Suresh J, Vilapurathu JK, et al. Development of fluorinated methoxylated chalcones as selective monoamine oxidase-B inhibitors: Synthesis, biochemistry and molecular docking studies. Bioorg Chem. 2015;62:22-9. doi: 10.1016/j.bioorg.2015.07.001. [PubMed: 26189013]. 9 Morris GM, Huey R, Lindstrom W, Sanner MF, Belew RK, Goodsell DS, et al. AutoDock4 and AutoDockTools4: Automated docking with selective receptor flexibility. J Comput Chem. 2009;30(16):2785-91. doi: 10.1002/jcc.21256. [PubMed: 19399780]. [PubMed Central: PMC2760638]. 10 Gaweska H, Fitzpatrick PF. Structures and mechanism of the monoamine oxidase family. Biomol Concepts. 2011;2(5):365-77. doi: 10.1515/BMC.2011.030. [PubMed: 22022344]. [PubMed Central: PMC3197729]. 11 De Colibus L, Li M, Binda C, Lustig A, Edmondson DE, Mattevi A. Three-dimensional structure of human monoamine oxidase A (MAO A): Relation to the structures of rat MAO A and human MAO B. Proc Natl Acad Sci U S A. 2005;102(36):12684-9. doi: 10.1073/pnas.0505975102. [PubMed: 16129825]. [PubMed Central: PMC1200291]. 12 Rizvi SM, Shakil S, Haneef M. A simple click by click protocol to perform docking: AutoDock 4.2 made easy for non-bioinformaticians. EXCLI J. 2013;12:831-57. [PubMed: 26648810]. [PubMed Central: PMC4669947]. 13 Du X, Li Y, Xia YL, Ai SM, Liang J, Sang P, et al. Insights into protein-ligand interactions: Mechanisms, models, and methods. Int J Mol Sci. 2016;17(2). doi: 10.3390/ijms17020144. [PubMed: 26821017]. [PubMed Central: PMC4783878]. 14 Sivaraman D, Srikanth J. Discovery of novel monoamine oxidase-B inhibitors by molecular docking approach for alzheimer’s and parkinson’s disease treatment. Int J Pharm Sci Rev Res. 2016;40(1):245-50. 15 Darras FH, Pang YP. On the use of the experimentally determined enzyme inhibition constant as a measure of absolute binding affinity. Biochem Biophys Res Commun. 2017;489(4):451-4. doi: 10.1016/j.bbrc.2017.05.168. [PubMed: 28571743]. 16 Rajeswari A, Sabesan M. Inhibition of monoamine oxidase-B by the polyphenolic compound, curcumin and its metabolite tetrahydrocurcumin, in a model of Parkinson's disease induced by MPTP neurodegeneration in mice. Inflammopharmacology. 2008;16(2):96-9. doi: 10.1007/s10787-007-1614-0. [PubMed: 18408903].